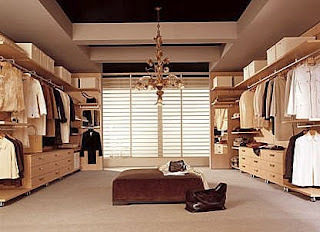 Every fashion lover's biggest dream might be : To Have a Big Fat Walk-in Wardrobe ! I've spent hours daydreaming of how my "dream walk-in wardrobe" would look like, especially when i'm standing right in front of my plain 4-door wooden wardrobe closet which i share with my husband. It's not a big wardrobe and the fact that i had to share it with my husband makes it impossible for me to put all my things in there. My husband has already being so kind to me that he said it's enough for him to ONLY had one little space in it and leave the rest of the wardrobe space for my piles of clothes, but i don't know why it's still not enough (lol). I still have to cramped a big pile of my clothes to the bottom of the wardrobe floor which makes me have to knee and bend my head inside the closet every time i need to find a certain clothing. And it's ridiculous if i'm in a hurry. I also have a medium sized shoe rack, but although i didn't share it with my husband (we each have a shoe-rack) and although i don't have that many shoes it's still insufficient. I had to put some of my shoes in a space beneath the stairs outside of my bedroom. And my bags don't even have their own space! I add 4 nails in the side of my wardrobe closet and hang them there, but there are only 4 nails so i just put the rest of my bags anywhere possible, such as between my stacks of clothing or cramped between a drawer of photo albums and piles of decorative junks. That's the reason why i constantly dreaming about having a massive walk-in wardrobe, just like the FashioniStars below... (maybe with an additional equipment of computerized system which can tell me everything from mixing n matching clothes for me to creating some kind of a fashion journal that would prevent me from wearing the same clothes in a short cycle ^o^). Well, Me and my husband will be moving to our new tiny apartment next year (i know it's still a long time because the apartment building is still under construction right now), but i already had a dream of building my first walk-in wardrobe in there ^O^. So i collected some preferences, i though it might be useful, who knows maybe my dream will come true? I'll take Mariah's shoes! Who keeps these closets so clean and organized on a daily basis! If I had a closet that size it would be a mess but I'd love to try! Fun post! Jesus Christ, Mariah's shoe collection! I am insanely jealous! I would love a walk in closet. Instead I have 3 closets spread out between our bedroom and the guest bedroom. The rest of my clothes are stuffed into 2 dressers! Oh well, I just drool over what those ladies have! Can I have all of them please?? Fab post! 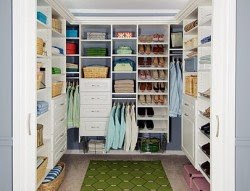 my dream is to have just the perfect closet!!! Any of them will work!! I live in a older townhouse with no real closet space. I have yet to dismantled my son's bedroom (who is away at college) and turn it into a office/closet, in another year or two I can have that room. yep, the stars have it all, don't they? Technically I do have a walk in wardrobe, but it's no where near as well appointed as any of those, it's basically a small room with 2 small chest of drawers and a full length clothes rail in it. To be honest it's just an excuse to shut the door on the mess I leave my clothes in! One day I'll sort it out so it's all pretty like those! It's not featured here, but I'd love Rachel Zoe's walk-in closet. Great post! ENVYYYYYYYYYYYYYYYYY! is the only word that resume my feelings right now!! well then i gotta start browsing for rachel Zoe's closet picture, i love her style when she was nicole's and mischa's stylist. I Love Mariahs. I'm lucky enough to have a very considerate mother who loves her daughter occupying the top step of the fashion ladder and she allowed me to turn the bottom floor of our house into a bedroom and wardrobe. I turned the living room into a bedroom and the two bedrooms off the living room and the laundry into my own personal utopia of walk-in wardrobes. I looved Nicky and Fergie's wardrobes! i really looooved nicky hilton's!!! great blog by the way...i really enjoy reading it...its like a breath of fresh air!!! I like all of them, the ultimate in luxury and great fun. I had one from walkinwardrobezone.com, well Pah design Ltd. Its stunning, designed really well and incorporates all I need. Its Italian so had to wait a while for it to be made but it was worth it. Paul the designer was great and really helpful, I would never be without one. Please just take a look at www.walkinwardrobezone.com they helped me with my walk in wardrobe and it is stunning. The best I could find and they actually specialise in dressing rooms. A great service and design. Speak to Paul. Beautiful furniture and finishes. 100% A1!!!! Thanks for this inspiration, I can't believe how much Paula Abdul has for a B grade celebrity.. I'm really Glad i discovered this site.Added twothousandthings.blogspot.com to my bookmark! Thank goodness, both Eva and Fergie's closets in one page. Lovely! I wish you had more photos.